Natural Orders has been purchased and is now in its new home! This summer has been chock full of good news. Let' s see what the fall brings! I am not sure how I angled my self into this position, but I am churning out a lot of dog paintings these day! All joking aside I am so happy that Bob & Ellie was finished just in time for the 10 year anniversary of Paws of Distinction Party. This piece was commissioned by the wonderful people love at Paws of Distinction in New Paltz , NY. Last summer I donated a gift certificate to Raven Tooth to a fundraiser for the Ulster County SPCA . The fundraised, called Dogs Ink, featured the artwork of Ty Foster and was a big success. The good people at Paws made a winning bid and months of hard work later here we are. I could not be happier to announces that the very Talented Ryan Myers will be showing his work through Raven Tooth Gallery this Summer. Peculiar Children's Chorus will Open on July 10th, with an Artist's Reception from 7-10- The work of Ryan Myers will be decorating the gallery walls all the way through August. We hope to see your at the Artist's Reception! Thank you so much to everyone who came out last moth to Ad Lib at Art Bar in Kingston, NY. The show was beautiful, the space was professional and the performance was excellent. What a great venue to show work! Thank you again to Hawley Hussey, Bill Brovold and Lark Kidder. I was a pleasure to show work with such talented artists! Know Your Ghost has found its forever home. Later this week I will be sending it out to South Coast Massachusetts. I am excited that it will end up in New England where it was created. I am super excited to be showing at a new venue! Check out this show opening at Art Bar in Kingston, NY. It is an honor to be invited to show with this group of accomplished artists. Please come out for our opening this Saturday! Looks like I'm headed to New Bedford for one more exhibition. My work will be in the 2015 MAE Exhibition this weekend! Come see the artwork of this sensational group of art teachers. I am excited to make my return to the Mohonk Barn Museum. All of March and April you can see my new work in Altars & Offerings. Altars & Offerings is a mix of works centering around the ideas of memory and divination. I am curious about the way our memories unravel behind us as we move through time and I am interested by the ways in which we try to peer into the uncertainty of the future. As someone who is not particularly superstitious, the notion of omens and portents are intriguing to me. This body of work started in early 2013 when I made myself a Ouija Board. This was a project that I had floating through my head for a number of years and that spring the timing seemed right. I exhibited the board along with some of my other paintings in a show called Negative Space at the UGLY Gallery (New Bedford, MA). I could not have expected the reaction that the Ouija Board brought about. People seemed to have a morbid fascination with it and I find now that people have a similar reaction to most tools for divination. Whether through tarot cards, rune stones or palmistry, we love to believe we can gain insight to our future. Since that exhibition I have continued to explore the ides of foretelling and forgetting in a variety of media. Check out my submission to the Guts N' Glory Ink's holiday artist swap Folklore. It's my take on the American fable The Devil Went Down to Georgia. If you've never heard the song follow this link. I thought it would be a fun experiment to post an in progress collage of the piece while I was working on. If you like these in progress photos leave a comment and let me know so I can do it again. Halloween is my favorite time of year, and its not just because of the candy. 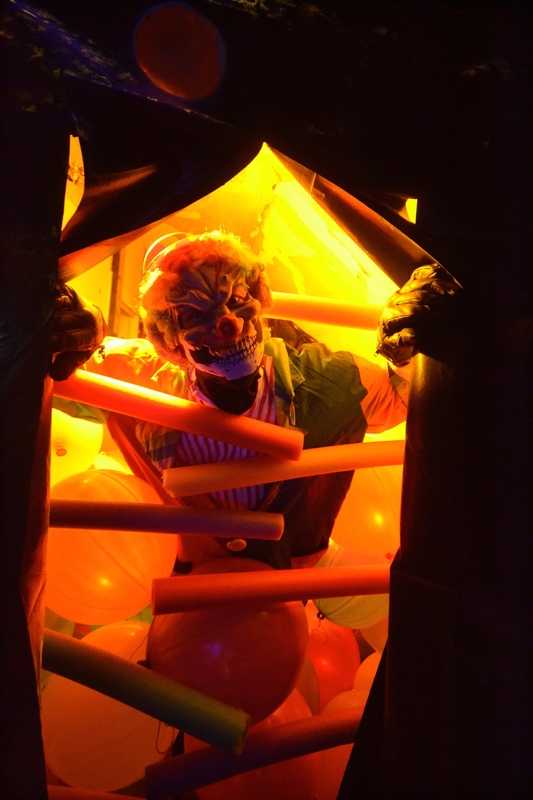 This year I was fortunate enough to help plan and build the Haunted House at the Mohonk Mountain House in New Paltz, NY. This year’s theme of Fears and Phobias was the brain child of Activities Manager and partner in rime Cindy Heitz. Check out the pictures below to see some of my favorite rooms, as well as, a Raven Tooth homage that snuck its way in.